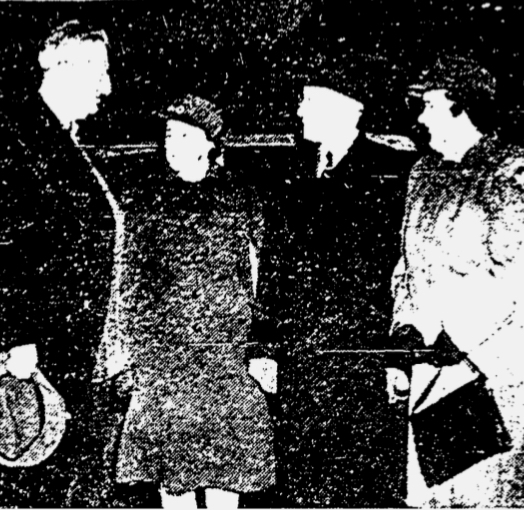 Newspaper photo from The Hartford Courant, Feb. 16, 1946 showing Red Cross and Motor Corps members (left to right) Mr. Spellacy, Mrs. Menard, John Luddy, and Mrs. Lindquist. In the days following the 1944 Hartford Circus fire, Mrs. Martha “Mattye” Menard of Windsor, Connecticut was one of many witnesses called to appear before the Commissioner of State Police/State Fire Marshal, Edward J. Hickey. Commissioner Hickey would use these statements and testimonies as the backbone of his investigation into the cause and origin of the circus fire, often having his detectives follow up on information discovered in this inquiry. The results of his investigation would be detailed in the Commissioner’s Report to the State’s Attorney for Hartford County, dated January 11, 1945 - where Hickey would declare that the fire was “caused by the carelessness of an unidentified smoker and patron who threw a lighted cigarette to the ground”. Mrs. Menard, a member of the Red Cross Motor Corps, testified to the commissioner that she arrived at Municipal Hospital in Hartford a few hours after the circus fire, around 4pm. She was stationed at the front entrance of the hospital when a hysterical male patient was brought in. Slightly built with a dark complexion and his upper body reddened as if sunburned, this man wore khaki pants and had a bandage tied around his left leg. A nurse's aide lit a cigarette for him, and he called Mrs. Menard over. He asked her name, and he told her his name was Harry Lakin. At first, Mrs. Menard thought that Mr. Lakin might be drunk or under the influence of something, though she did not smell alcohol on him. Mr. Lakin asked her to hold his hand, and as she did he began making some statements that she thought were peculiar. He said that he was an electrician with the circus, and that he worked the spotlights. As Mrs. Menard continued to console him, he exclaimed, "I'm not squealing!" and began to cry. Mrs. Menard recalled that he also said, "I never knew it would be like this” and something like "I don't know that I can take it." She explained to Mr. Lakin that his injury wasn't very severe - no blood and no swelling - and that he should toughen up. Mr. Lakin was then taken on a stretcher to the X-ray room, and Mrs. Menard would never see him again. Mrs. Menard’s credibility as a witness would not likely have been questioned at the time. Mattye was 41 years old, college educated and married with a teenaged son who would later become a policeman and a police chief. She was a Windsor schoolteacher, math and science, and a very active member of several groups in Windsor including the PTA, the War Council’s Citizen Service Corps, and the Red Cross Motor Corps. Harry Lewis Lakin, Jr., 28 years old, appears on the Casualty Lists compiled July 6, 1944 at 8:20pm, July 7 at 7am and again on July 10 at 9am. Lakin is listed as "injured" at Municipal Hospital, on the third floor, and it was noted that he was from Cumberland Center, Portland, Maine. No further investigation of Harry Lakin appears to have been made by Connecticut authorities - police didn’t question him nor was he called to testify before Commissioner Hickey. His statements made to Mrs. Menard when he was brought into the hospital were apparently dismissed as insignificant, or possibly the commissioner overlooked these statements since they didn't strengthen his conclusion that the fire was started by a carelessly tossed cigarette - a conclusion that would be proven unlikely several decades later by the Connecticut State Police. As suspicious as Portland Maine native and circus light man Harry Lakin's statements sound on their own - "I'm not squealing!" and "I never knew it would be like this" - their importance should have become infinitely more curious six years later in 1950 when Robert Dale Segee made headlines for confessing to setting the Hartford circus fire, a confession he would later deny. Segee joined the circus just days before the circus fire in 1944, when the show was in his hometown of Portland, Maine - hired by Whitey Versteeg, the circus' Electrical Department foreman, and assigned to work with the spotlights. Segee held the same job as Lakin, and was from the same hometown as Lakin. Could Segee have been the person that Lakin wasn't going to squeal on? Could Lakin have witnessed Segee setting the fire? It's possible, even likely, that these two men were together, and maybe Segee started a fire and they both figured it would be put out quickly - circus tent fires usually were noticed and extinguished quickly by the circus’ seatmen. But this particular fire on July 6, 1944 wasn't noticed until it was too late, due in part to the seatmen who were out of position. It’s difficult, if not impossible, to further investigate these statements now, since all of the parties mentioned have since died. Martha “Mattye” Menard passed away in 1993, in Portland Maine, at the age of 90.